How do you order Gravol Ginger Lozenges online? You can order Gravol Ginger Lozenges online at a cheap cost from Canada. YouDrugstore is an online pharmacy based in Canada. That means when you buy Gravol Ginger Lozenges from us you pay the same low prices Canadians pay. All you need to do is register a free account on our website and then add Gravol Ginger Lozenges to your cart. You can also call us to place your order at 1-855-968-6337. Purchase Gravol Ginger Lozenges at discount prices from YouDrugstore.com and we will ship your order directly to your home. Keep in mind that we provide free shipping on any order over $100. Gravol Ginger Lozenges are used to combat the symptoms of motion sickness. Purchase your cheap Gravol Ginger Lozenges from YouDrugstore today and find relief from the symptoms of motion sickness. Who might benefit by taking Gravol Ginger Lozenges? If you suffer from motion sickness, or fear that you might due to traveling in the near future, Gravol Ginger Lozenges may be the right choice for you. Gravol Ginger Lozenges are a great way to combat motion sickness, such as airsickness and seasickness, in teenagers and adults alike. Not only that, but Gravol Ginger Lozenges are also recommended for children aged six years and older. Motion sickness is a condition in which you experience nausea, dizziness, and/or vomiting due to motion. It is caused by your inner ear giving your brain different signals about how you are moving compared to the movement your eyes see. Gravol Ginger Lozenges are also non-drowsy, making them great for those who worry about treatments making them feel tired. Consult your doctor before using Gravol Ginger Lozenges if you are pregnant or breastfeeding. 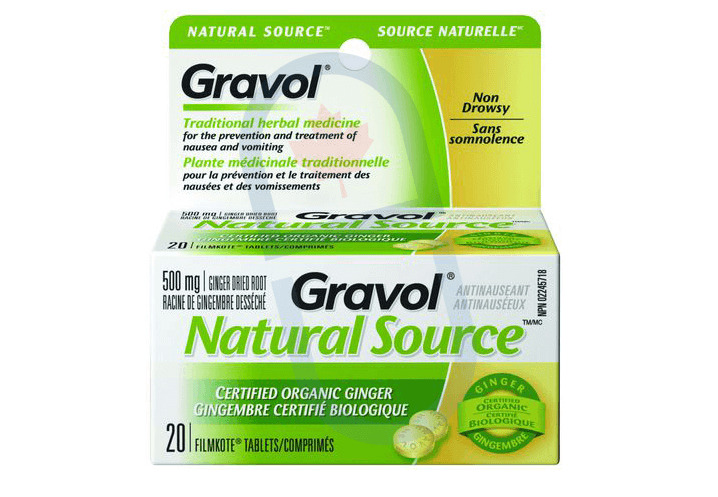 Why are Gravol Ginger Lozenges recommended to treat motion sickness? Gravol Ginger Lozenges are soft, chewable, and great-tasting tablets. This makes treating your motion sickness enjoyable. Gravol is also clinically proven to reduce the symptoms of motion sickness. As mentioned above, one of the biggest advantages to using Gravol Ginger Lozenges to treat your motion sickness is that they are non-drowsy. Stop worrying about drowsiness, and start taking control of your motion sickness with Gravol Ginger Lozenges. These lozenges contain natural source, certified organic ginger, which doubles their effectiveness against nausea and vomiting. Ginger is known to help alleviate nausea, as well as indigestion. Order Gravol Ginger Lozenges today at discount prices from YouDrugstore and prevent motion sickness. What are the side effects of taking Gravol Ginger Lozenges? As with any medication or treatment, you may experience side effects when taking Gravol Ginger Lozenges. The most commonly-reported side effects of taking Gravol Ginger Lozenges include hyperactivity (especially in children), dry mouth or throat, headache, ringing in the ears, blurred vision, and new or worsened dizziness. If you do experience any side effects, do not worry: most side effects are generally quite mild. However, talk to your doctor right away if you experience any severe or persistent side effects. In rare cases, Gravol Ginger Lozenges may cause a change in heartbeat. Stop taking Gravol Ginger Lozenges and speak to your doctor immediately if you experience this rare side effect. When should you take Gravol Ginger Lozenges? It is recommended that you take two Gravol Ginger Lozenges every four hours as needed. However, do not use more than six lozenges a day. If you are taking Gravol Ginger Lozenges to prevent motion sickness while you travel, take two lozenges at least 30 minutes before you begin traveling. Only use Gravol Ginger Lozenges as needed. Consult your health care provider before using Gravol Ginger Lozenges for prolonged use. If you have any questions or concerns about taking Gravol Ginger Lozenges call your doctor. Where can I learn more about Gravol Ginger Lozenges?